The Tree of Life Breastfeeding photos have broke the internet. So many moms who were too nervous to share their breastfeeding photo in the past have found confidence doing so with the #treeoflife edit from Picsart. When I saw the thousands of comments on the first tree of life photo I posted, followed by articles from The Huffington Post and today.com, I knew that something special was happening. I had the idea to do a contest as a way of getting moms excited to share their tree of life edits! Picsart caught wind of my idea and they wanted to collaborate with us! We will be hosting the #treeoflife contest on Instagram starting tomorrow , Friday December 23rd! Win a 16 X 16 Canvas Print of your very own Tree of Life photo in the Picsart/BFMT #TreeofLife photo Contest on Instagram! *Please share this blog and tag friends! Contest will run for about five days and the winner will be randomly chosen & will be announced on January 4th 2017! Domestic Shipping only! So sorry to our international mamas ! You can certainly participate though! Need help figuring out how to do the tree of life edit on your photo? Nathan Brannon is a comedian out of Portland, Oregon and recently released a comedy album with the record label Kill Rock Stars, and wanted to use the overall theme of the album to promote/support breastfeeding mothers. When it comes to math my seven year old is at the top of his class, but when it comes to spelling and reading he definitely needs a little more help in that area. After failing his spelling test for the third week in a row, I knew we had to do something about this. We tried flash cards. We looked into tutors. We tried some word apps, but nothing seemed to really click with him or hold his interest. Then we stumbled upon VocabularySpellingCity and that is what changed word study time into word fun time. When you first enter their website www.spellingcity.com you will see their home page. They allow you to sample their site before signing up. Which I loved because I hate spending all that time signing up for something I may not like . I encourage you to sign up though because I know you won’t be disappointed and all new members get a 14 day free trial so that you can see all that their website is capable of before paying any money. Okay, so once I was all signed up I created my first spelling list. Yes! You get to use your own words you want them to learn and VocabularySpellingCity automatically does all the hard work and incorporates them into their games! You click on “List Management” and then “Create List.” It gives you the option to add one to five words , but I suggest adding all five so that they will be able to use all of their games as some of their games require a five word list to play them. Then off you go to play their games. Here is a screen grab of what the Learning activity’s and games page looks like. One of my sons favorite game is the “Aim 2 Spell.” It’s a cat sitting in the middle of the tunnel and it has to grab the correct letter as they go by. You may think, “Well how is that gonna help my kid learn to spell words?” That is what I thought as well until he got 12 out of 15 words correct on his spelling test last week! After failing his tests for three weeks in a row it was huge progress and I have a feeling that his spelling will progress as time goes on! How their program helps them learn the words is repetition. Seeing the words, hearing the words, putting the words together. Just as you would with flash cards or writing them over and over again except their program is one kids will actually want to do which means more focusing and being more present. I am forever grateful to VocabularySpellingCity for existing because I was ready to fork out $200 or more a month on a tutor ! So I feel like their price of $35 for the YEAR is a steal if you ask me. When I told VocabularySpellingCity about my experience and that I run a community they were so thrilled that they wanted to offer the BFMT community a 10% off code for a limited time ! SWEET! You can grab the code on the Facebook Post. They also asked if I would be willing to share about my experience with all of you! Disclaimer- I received compensation in exchange for sharing my experience with SpellingCity . Although this post is sponsored, all opinions are my own. The most common question I hear. Worrying about whether baby is getting enough milk is a natural and normal concern. Especially since , most of the time you’re not actually getting to SEE the milk with your eyes. Thing is, it’s not black and white. I wish I could give you some top secret recipe that would be the cure all for every single breastfeeding mom out there worried about her supply , but I can’t. First thing I ask is , “Why do you think you have an issue with your supply?” Most of the time I get the reply of , “Well because I’m only able to pump an ounce or two at a time.” Now here is the magical answer that should calm your nerves a bit. Only being able to pump an ounce or two is actually pretty normal. While it can be frustrating, you don’t actually NEED three refrigerators full of milk. Also, something very important to understand is the amount of milk you pumped out is not a true indicator of your supply. So while you were only able to get two ounces out with a pump, there could very easily be two ounces or more left in your breasts . Try placing baby on the breast after each pumping session.. Your body produces more milk when your breasts empty. The more they empty , the more they will make. A baby can get the milk out far more efficiently than a pump ever could. Now if you suspect there is a real issue with your supply go through the checklist. Is there plenty of wet diapers? gaining weight? Does baby seem content after nursing? If you can answer yes to all of those then everything seems to be on track, BUT and this is a big but, I recommend you get an assessment from an experienced IBCLC. I recommend ALL newly breastfeeding moms have a visit or two with one , even if everything seems to be going fine. Only because they may spot something you didn’t , be able to help and provide comfort you may not have known you even needed , and more importantly they can assess your situation & will most likely, be able to conclusively tell you if your baby isn’t getting enough milk. The great thing about IBCLC’s is the fact breastfeeding is all they do. That is their specialty, and a GOOD IBCLC will be able to assess on an individual basis to come up with a specific game plan. Most IBCLC’s also keep up with new information that comes out about breastfeeding every single day. Whereas a doctor may not even have any formal education in breastfeeding and will make it black and white. I’ve known a lot of doctors who immediately rush to, “Just top up with a bottle after every feed if you’re worried” without even assessing the mom on an individual basis! Our society does not take breastfeeding as serious as they should or as serious as the mom who chose to breastfeed does. So even though topping up after a feed could be detrimental to your breastfeeding relationship , to them, it doesn’t matter one way or another. To them , it’s ‘Well good thing there is always formula you can turn to.” When a mom makes the choice to breastfeed healthcare professionals, friends, and family , should do whatever it takes to help the mom meet her breastfeeding goals, even if they don’t believe it’s worth the “hassle” because clearly the ones breastfeeding thinks that it is. Instead of , making it sound like , “Well who cares if your supply tanked , baby is being fed at least.” When had they given a correct assessment , it very well could have been avoided! Of course , all that matters at the end of the day is a happy, content, baby with a full belly, but that doesn’t mean a mom should be coerced into her backup plan earlier than she wanted. Example- Most moms plan and prefer to have a vaginal delivery , but by necessity ended up having to have a C-section instead. At the end of the day , is it great that the baby still came out happy and healthy, despite not giving birth had she wanted? Sure , but it wasn’t something she wanted or planned on doing . She would have preferred giving birth vaginally. Do we need to start a hashtag #BirthIsBest, to ensure those moms realize that? No. Because they do realize it and they are grateful that another means of delivery was possible because the end goal is the same for both scenarios, a happy , healthy baby came out of it , but it doesn’t mean she can’t be disappointed and it doesn’t make her wrong for wanting to hold out for a vaginal birth , until she was absolutely certain it was the right choice. She doesn’t need to hear during that , “It’s just a C-section , C-sections are a good thing, they save so many babies every year.” DUH… Captain obvious , that is why she ended up okaying because no matter what it takes and how it’s done if it leads to a happy thriving baby , then so be it. The invention of formula is great , but that doesn’t mean breastfeeding should be pushed aside & dismissed so easily , just because an alternative feeding option exist. Now if a mom , expressed feelings that she really doesn’t want to continue on with breastfeeding for whatever reason and there are lots of reasons why a mom would choose so of her own free will , then of course, support her through it. At that point it would be appropriate to say things like, “Well it’s a good thing you can turn to an alternative feeding method. All that matters is that your baby is fed.” Say that stuff AFTER, she herself, expresses her desire to no longer breastfeed. Let her come to that decision on her own , don’t push it along. Formula can be a Godsend for many and as a breastfeeding advocate , I’m happy it exists , but we need to stop pushing it on moms and making them needlessly doubt their own body’s ability to nourish her child. Unless there is evidence that baby isn’t getting enough milk & unless a breastfeeding mom sates her desire to formula feed, respect her breasts. your feeding journey is unique to you. You had a choice to make or maybe a choice was made for you medically. I, as a mother, a woman and a friend support your choice. This is not a one sided story adding to a never ending debate between which is the lesser evil. This is in no way shared to make any woman feel bad for her own feeding journey. This is the only journey I know – this is my feeding journey. I never wanted to breastfeed. It was something I was against. Time and time again I compared it to dairy farm animal behavior. I didn’t care how others chose to feed their children but for me it was a absolute no. I couldn’t even be in a room with a breastfeeding mom… the whole thing creeped me out and made me uncomfortable. Coming from a family of formula feeders it really is no surprise where my negative feelings started. Myself and my 2 cousins are among the first generation of exclusive breast feeders in our family. If I’m being honest, we still really don’t have the support we need. I don’t really think those who chose not to breastfeed understand how hard, exhausting and lonely the journey can be for an exclusively breastfeeding mother. In the second and third trimesters of my pregnancy I started buying formula and bottles. Stocking up on every brand and option available. I signed up for samples and coupons and collected all that I could for my formula feeding journey. I can’t express how strongly I felt that I would never breastfeed a baby in my life… yes… by choice!! I received a lot of negativity on my opinion from breastfeeding friends and a lot of support from my formula feeding family. I didn’t know much about being a mom but I knew that this was a area of motherhood I had all figured out. I pumped and pumped and pumped. Every 2 hours for 20 minutes. I pumped 3-4 times in the middle of the night. I pumped while my husband fed our daughter. I missed out on so much. The opportunity to hold her and feed her and nourish her with breastmilk or formula because of my own reservations and adamance not to breastfeed. When I wasn’t pumping I was washing bottles and organizing the pieces. She was formula and breastmilk fed from day 4-7 and then a plethora of other issues presented themselves. Inconsolable crying, not eating, not getting comfortable, uncontrollable vomiting. Imari was born with severe acid reflux. On top to this she had food sensitivities to almost everything. We realized quickly that she was allergic to dairy and quickly switched to supplementing with soy based and she broke out in hives. At this point the stress levels were high and we had a very unhappy baby. I decided that we would exclusively give her breastmilk and we stopped all formula at 7 days old. Again…. pump pump pump, sanitize bottles…. over and over and over… day and night. Still, never feeding her because I was busy… you guessed it! Pumping! One day between the baby blues, the pumping and the realization that in a few weeks my husband was going back to work and I would be doing this all alone I decided enough was enough. Let’s try latching baby again. We called in a private lactation consultant into our home to sit with me to privately and properly show me how it’s done. Imari had latched herself within 20 minutes thanks to the lactation consultants help. I had spent hours and hours and hours trying alone and all I needed was someone, a woman, to empower me and give me the confidence that I could do this. I was lucky. Imari wanted to breastfeed. She was a baby who never gave up on her mom. She kept trying to feed even when I was holding her with tears running down my face and milk running down my chest. I cried, I cried day and night. I cried because I was frustrated, I cried because I needed support. I cried because I felt ashamed to breastfeed my baby. I cried because inside I was fighting an emotional war with myself. The one side that was disgusted with myself and the other side that was just trying to be a good mom. Imari was resilient to her stomach issues and looked at me with understanding eyes every time I had a emotional breakdown. She truly went through every bump in the road with me. The troubles didn’t end there. With Imari’s acid reflux breastfeeding was still a struggle. I would feed her and she would be calm and comforted one moment and the next moment she would push off my chest hitting me, hands in the air, screaming bloody murder and projectile vomiting. This went on for 2 weeks and with the reflux getting more and more difficult for the 3 of us we decided to have her put on Ranitidine. That wasn’t a first choice and as a couple who doesn’t believe in pharmaceuticals, a very hard one. From the day she was put on antacid she was a brand new baby. I had also dramatically changed my diet – I was a proud vegetarian but her allergies and gassy food sensitivities included soy, dairy, nuts, beans, lentils and cocoa. I decided against my personal beliefs to start eating meat again… to nourish her with protein the only way I knew how. She was finally, no longer in pain and could feed how a baby is supposed to. That day, at 2 weeks old we boxed up all of our bottles and formula and put them away. We haven’t used either since. Breastfeeding, once my anxiety was gone became easy to us. Imari wanted to feed and I wanted to feed her. The journey was long, the journey was hard, but the journey was worth it. It really doesn’t matter if you choose to breastfeed or formula feed your baby… either way it’s going to be a struggle. I am a mom who started my path on formula and took a fork in the road for a journey into breastfeeding. I can honestly say both were exhausting. I have tested myself emotionally and mentally for the past 4 months. I was ashamed to tell my mom and grandmother that I had to start breastfeeding. Can you believe that? Literally ashamed in fear of what they will think. Are they going to call me disgusting behind my back? Something so natural had me emotionally hating myself. I still can’t feed in public. It gives me anxiety and I feel very awkward. Thankfully my daughter is amazing and understanding. She is right there with me every step of the way. I’ve become a pro at car feedings and recently fed her in a restaurant with a cover up. I’m extremely proud of that. The feeding only lasted 4 minutes because she couldn’t concentrate, but it’s these baby steps that are important for my growth as a new mom. My husband and I often reflect back to that person I used to be, before Imari, before being a mom. We are still so shocked at how far I’ve come. Freezing breastmilk is a hobby for me now, literally. I challenge myself to how much I can get in one sitting. I’m very fortunate to have an abundance of milk and can easily pump 10 oz in under 15 minutes. That’s something, this new me, is also extremely proud of. I decided to post this picture in support of a ongoing breastfeeding movement because what I’m doing is not disgusting, it isn’t shameful. It’s beautiful. It’s how my daughter is growing and getting her nourishment. I don’t think that’s something to be ashamed of. What I ask for is love and support from the women in my life. Regardless of your personal views, regardless of how you were raised or your beliefs, please be kind. It takes a special kind of woman to make the sacrifices I’ve made emotionally and mentally. My journey has been long, my journey has been hard. I have cried more tears than I ever dreamed imaginable. I have given my feeding journey a good fight. Please do not fight against me. Please fight with me. The C.A.R.E. Code Alliance of the Best for Babes Foundation is the first-ever alliance of companies, nonprofit organizations and media outlets putting positive pressure on the Booby Traps® to help make the 360-degree world around expecting and new moms safe, supportive and positive. In hospitals and health providers’ offices, in stores and public spaces, at work and among friends and family, the Allies are making a long-term investment in protecting healthy infant feeding and are positioned as trustworthy for expecting moms, new parents, and the public. Moms are bombarded daily with information about infant feeding, but not all of it is reliable, and much of it undermines infant feeding decisions and breastfeeding success rates. All expecting and new moms deserve to know what businesses “have their backs” during the most vulnerable period of motherhood, just as they deserve to know which car seat is safest, which health care providers to trust, and which blogs or websites to turn to for accurate information. The C.A.R.E. 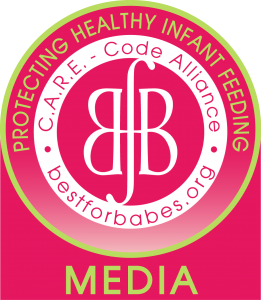 Code Alliance program, and its accompanying seal, rewards and recognizes businesses, nonprofits and blogs that protect healthy infant feeding by marketing them to families and the media. Members of the Alliance pledge to uphold a core set of criteria, as well as the Best for Babes Credo, and promise to raise mainstream awareness of the International WHO Code and of the importance of positive messaging for breastfeeding. I encourage you to learn more about Best for Babes and to support my fellow Alliance members this holiday season and beyond! You can join the CARE Code Deals page on Facebook to stay up to date with the latest deals and sales!